Older people with dementia often spend a long time in hospital whilst they are recovering from their acute illness and are well enough to be discharged. During this time and due to the natural constraints of a hospital environment, such as low levels of natural light, lack of access to gardens and day rooms with fewer recreational activities, some patients can feel bored or unstimulated. This can have an impact on patients with memory impairment, and may lead to an increased risk of falling, as they try to move around in an unfamiliar environment. Reduced stimulation and an inability to engage in their normal daily activities can also cause patients to exhibit other behavioural and emotional changes, and lead to feelings of isolation and distress. 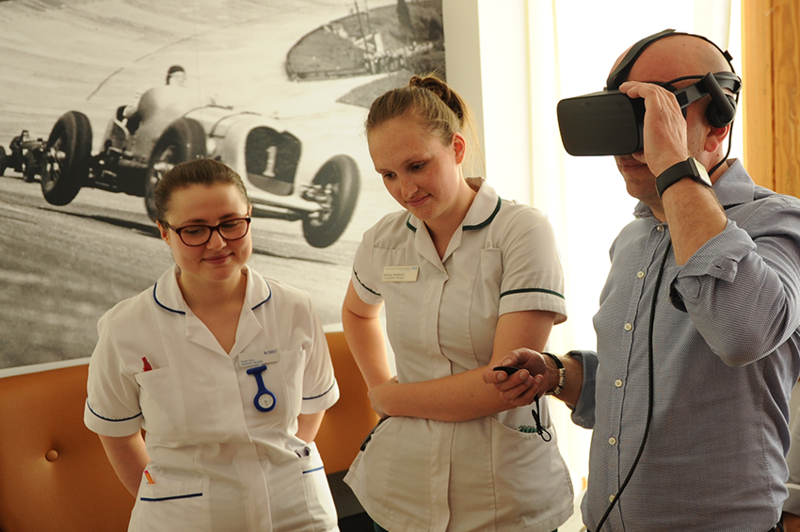 The medical division has recently purchased a Virtual Reality (VR) system from Trust charity fund monies to hopefully improve the experience of patients suffering from dementia. The headset provides a three-dimensional, computer generated environment which can be explored and interacted with by the person. The person becomes part of this virtual world and becomes immersed within this environment. The unit provides a visual and auditory experience which includes a nostalgic beach scene, a forest full of animals and an underwater experience of the coral reef and dolphins. The Virtual Reality unit, developed especially for patients with dementia, has been shown to improve patients moods and can leave a long lasting calming effect sometimes hours after the experience. Pictured above are some of our staff trying it out for themselves - so far the feedback has been really positive.